But for all its size and economic vitality, it's hard to get too excited about the tower sites to be seen in the Triangle. It's not that the stations aren't interesting - but once you've seen the site at the right, you've seen most of the excitement the market offers. That site is WPTF, 680 on your dial, the 50,000-watt voice of Raleigh - and for more than half a century, it's used this site on E. Chatham Street in Cary, just south of NC 54, the highway that links Raleigh and Durham. When this site was built, of course, it was way out in the country; today, it's right in the heart of suburbs that now stretch far south to Fuquay-Varina, Apex and Holly Springs. This is still a good signal, though, nondirectional by day, and directional at night with a huge lobe over Raleigh itself and (fortuitously) the southern suburbs, with an adequate back lobe that covers Durham. And what's that atop the tall #1 tower behind that Art Deco transmitter building? It's not, as we once thought, the old mast for the WPTF-TV (Channel 28) antenna, from back in the days when there was a WPTF-TV - but it was definitely used for WPTF-FM 94.7, now WQDR - and we've heard that it was originally meant for a low-band VHF allocation that WPTF never won. Channel 28, meanwhile, wasn't WPTF-TV until 1978 (it was originally WNAO of the Raleigh News & Observer, then went dark, then returned as WRDU-TV and later WPTF-TV at a tower down in Apex that was later dismantled and moved to Wake Forest, where it's now used by classical WCPE 89.7.) Today, channel 28 is UPN affiliate WRDC from a much better site - and class A drop-in WWMY (102.9 Raleigh) occupies that spot on the 680 tower. 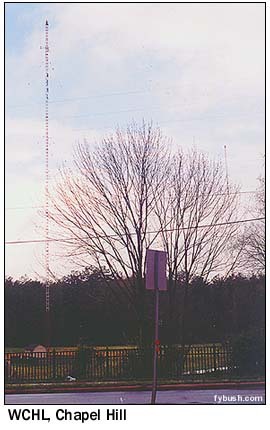 A short drive west of Cary on NC 54 gets us to the five-tower array of WRBZ (850); this is the old WKIX, a heritage Raleigh signal that used to operate from another site closer to town. Its current, relatively nondescript in-line array is already heavily encroached by a shopping center and housing developments. Let's head back into Raleigh, then, circling the north side of the city on I-440 to arrive at the Highwoods office center, home to a variety of unexciting concrete cubes that house NBC O&O WNCN (Channel 17, licensed to Goldsboro, far to the east); Clear Channel's local cluster; Curtis Media's radio cluster that includes WPTF and WWMY - and the Sinclair duopoly of WB affiliate WLFL (Channel 22) and UPN'er WRDC (Channel 28). 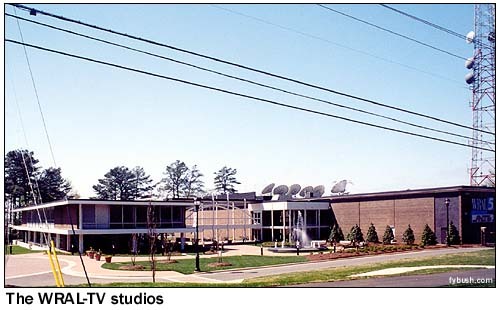 A more exciting studio can be found on Western Boulevard, on the west side of Raleigh: WRAL-TV (Channel 5) is one of the most successful locally-owned stations in America, the pride and joy of Jim Goodmon's Capitol Broadcasting group. 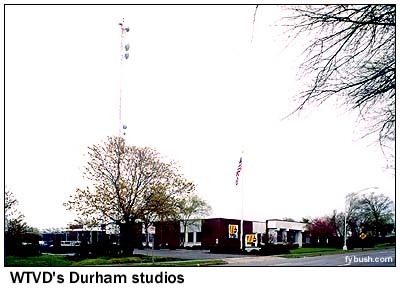 That's one big studio facility, and well it should be: WRAL was one of the first stations in America to broadcast a digital signal, way back in 1996, and it's still the only one we know of that does local news in high definition. Capitol also owns WRAL-FM (101.5), which has separate studios at Capitol's corporate headquarters on Hillsborough Street, and Fox affiliate WRAZ (Channel 50), which does its news from WRAL but has its own offices overlooking the downtown Durham stadium of the Durham Bulls, also a Capitol property. And yes, there was a WRAL(AM) once upon a time, too. It was on 1240, which now does religion as WPJL. But look at that tower, at 515 Bart Street on the east side of town - that's a lot of stick for a 1240, isn't it? Sure enough, those are batwings at the top of the stick - an early incarnation of WRAL-TV, we're pretty sure. 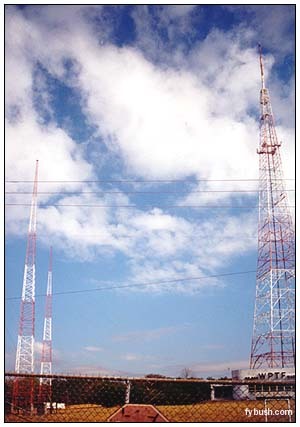 WTVD's 1994' tower outlasted two contemporaries; uneven thawing after a December 1989 ice storm brought down the equally tall towers of WRAL-TV 5 and WPTF-TV 28, the latter just three years old. 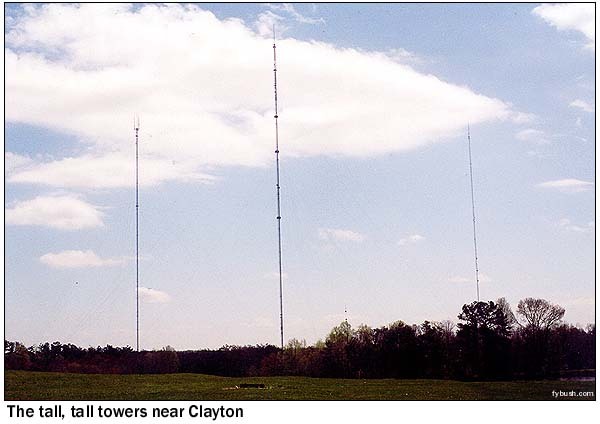 They were replaced in 1991 by the tower at center, a 1999' stick that's home to WRAL-TV, WRAZ 50, WRDC 28 (the successor to WPTF-TV), WQDR 94.7 (the old WPTF-FM) and WRAL-FM 101.5. At left in the photo above is the newest of the three towers, the 1988' candelabra that Capitol put up in 2000 for DTV. WRAL-DT 53 is here, as are WRAZ-DT 49, Sinclair's WLFL-DT 57 (WLFL's analog transmitter is south of town in Apex), and NBC's WNCN 17 and WNCN-DT 55. The rest of the market's TV is either far away (WRAY channel 30 and WRPX Channel 47 far to the east in Wilson and Rocky Mount) or over on the Chapel Hill side. Public TV comes from the University of North Carolina's WUNC-TV (Channel 4), the flagship of the statewide "UNC-TV" service - and its tower sits on Terrells Mountain, southwest of Chapel Hill, where it was presumably placed to provide some service to the Triad as well. Today, it shares the ridge with WUNC-FM (91.5), Durham-licensed WDCG (105.1) and Burlington move-in WRSN (93.9); we don't have a good picture because it was pouring rain and foggy when we visited! So we'll leave you with Chapel Hill's AM station, WCHL (1360), whose two towers are notable mainly because one of them has "W C H L" down its side - and we'll head back northeast next week as we check out the tower archaeology of Bloomsburg, Pennsylvania! Tower Site Calendar 2003 is now SOLD OUT! Stay tuned in the weeks to come as we open ordering for the even more exciting Tower Site Calendar 2004! Previous Site of the Week: Greenville-Washington, N.C. In Two Weeks: Bloomsburg, Pa.